Multi-published fiction author offers ideas and insights for readers and writers. Drop in for some warm, sometimes even witty observations on life and language and gratitude for the creative life. Please also visit my web site: www.susanaylworth.com. Welcome! The stories here change from time to time. Please return to visit often! 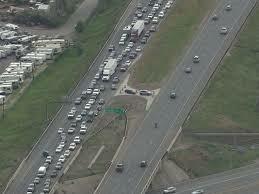 An old joke says you know it will be a bad day when you turn on the news to see evacuation routes out of your city. It isn't a joke when it happens. Take, for instance, last Sunday evening. 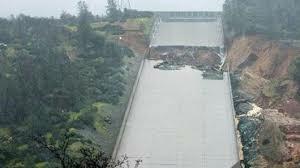 We were on our way to the nearby town of Oroville, headed to a son's birthday dinner, when we received a message. 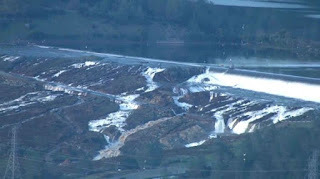 Our county sheriff had ordered the evacuation of Oroville due to the "expected failure" of a spillway on the nation's tallest dam. Almost immediately, the traffic going the opposite direction went from sparse to heavy to bumper-to-bumper as people fled the city where we were headed on their way to the city we had just left. Uhhh...? Phone calls and text messaging moved the dinner from one son's home below the dam to the home of another son above the lake. Then the traffic slowed in our direction as we joined others heading into the foothills. As a reporter for the local newspaper, my hubby had covered the Department of Water Resources (DWR). He knew the dam inside and out, quite literally, and understood what the risks were and weren't. Like most other drivers, we stayed calm, maintaining normal traffic patterns and even letting others into the lane in front of us. Not so with the folks who panicked. As we drove east, a car whizzed up the fog line on our right, going west at about twice the speed limit, backing up down the shoulder. Another car flew by on our left, possibly going as fast as eighty m.p.h. on a city street, dodging cars from both directions in the center turn lane. Those were only two of the people who behaved foolishly, even dangerously. Keeping perspective, we took a back-door route to go home that evening only to find the national news showing images we had just seen along the way. I promise we weren't laughing, but we weren't panicked either. Most of a week has passed. So far the spillway has held, the lake level is down, the evacuation order has been lifted, and things are back to what passes for normal. The only big difference for us has been a "sleep-over" with the three cute grandbabies in our downstream son's family. Although about 188,000 people are still under an evacuation warning, we're no longer in the national headlines (although we're still in the news) and it looks like the greatest risks may be behind us. So far the only people who have been injured were those who lost perspective, the folks who panicked and caused mash-ups along the evacuation routes. The lack of perspective on the part of the DWR is a matter for the politicians to unravel. Susan Aylworth is the author of 14 novels, all available as e-books. She loves her northern California home which she shares with her husband of 46 years and the two spoiled cats they serve. When she can't be with her seven children, seven great kids-in-law, and 25 grandbabies, she loves hanging with her fictional offspring, the children of her mind. She also loves hearing from readers. Visit her website at www.susanaylworth.com or find her @SusanAylworth, at .facebook.com/Susan.Aylworth.Author, or on Pinterest. Please share your thoughts, ideas, opinions, complaints or compliments. We're all reading and writing together. Copyright 2011 by Susan Aylworth. Picture Window theme. Powered by Blogger.